Loved by locals for its easy access and affordable quality dining, the Bully is the perfect place to enjoy a meal and drinks with the family or friends! Like Bull Creek Tavern On Facebook! “The Bully” (as it’s affectionately known) is loved by the locals for its pleasant atmosphere and friendly service in relaxed pub-style settings. The easy access and affordable quality dining makes it the perfect place to enjoy a meal with the family or just a drink with friends. Burgers and Brews is what the Bully is all about, with 13 brews on tap and 8 types of burgers. We also have all the pub favourites in our extensive à la carte menu to satisfy any craving. 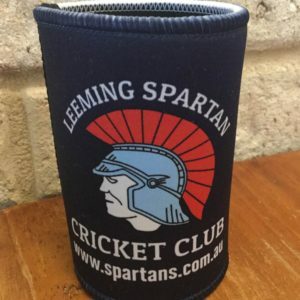 Get in contact with The Bull Creek Tavern for your next function or catch up with mates – less than five kilometres from the Leeming Spartan Cricket Club, you don’t need to look any further! Great discounts for all Spartan members. Whenever you make a purchase at the Bull Creek Tavern – food or drinks – just for you or a group – mention ‘Club 3’ and you save 10%, and the Club receives 5% of your purchase! So, essentially, by being a regular at the Bull Creek Tavern, you’re also doing your part for the Club! 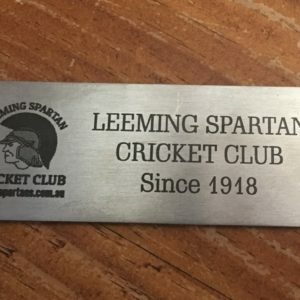 Spartans Save 10% off all purchases when they mention ‘Club 3’! 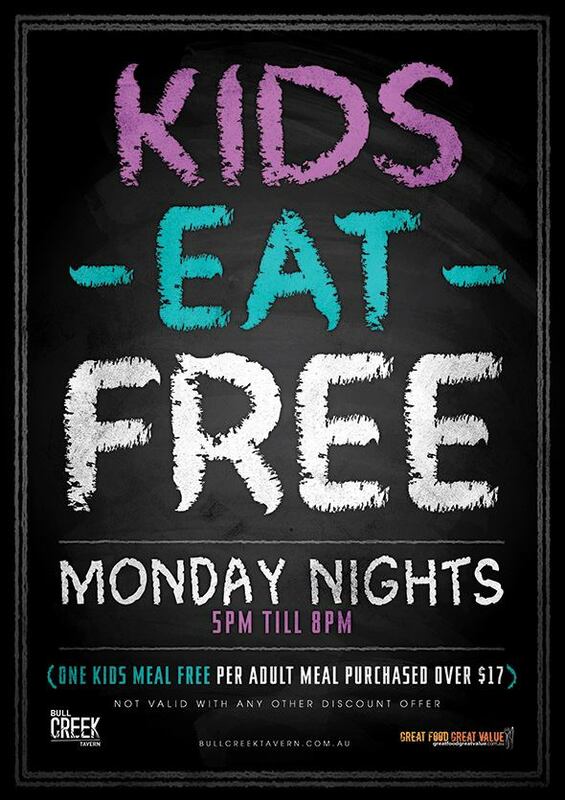 There’s always a special on thanks to our excellent chefs – check them out below! Burgers and Brews is what the Bully is all about, and we have 13 brews on tap and 8 types of burgers. We also have all the pub favourites in our extensive à la carte menu to satisfy any craving. There’s always something on at the Bull Creek Tavern! BBQ Cook Up – All Day Get A Massive Feed! Ship Ahoy – For Less Than $20.00, choose from a variety of fantastic and massive fish dishes, including chilli muscles and the captain’s loot! 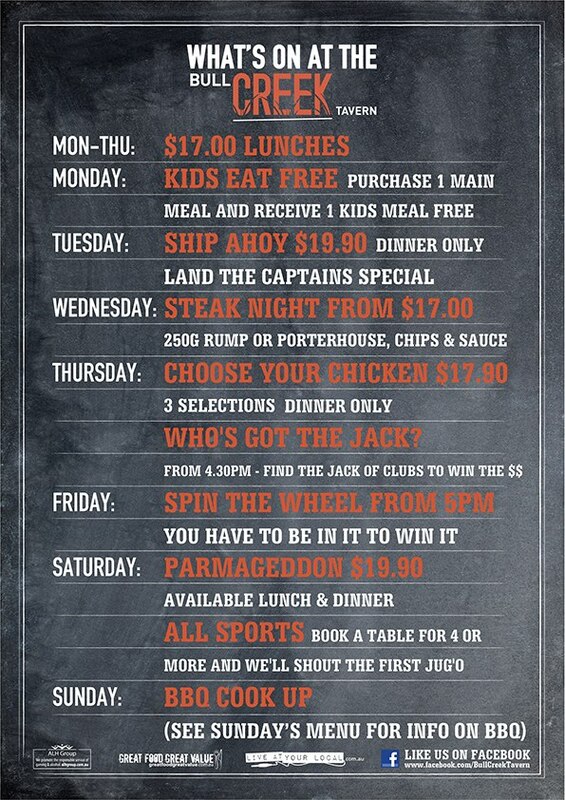 Steak Night – From $17.00, get a great steak feed – 250g rump or porterhouse, with chips! 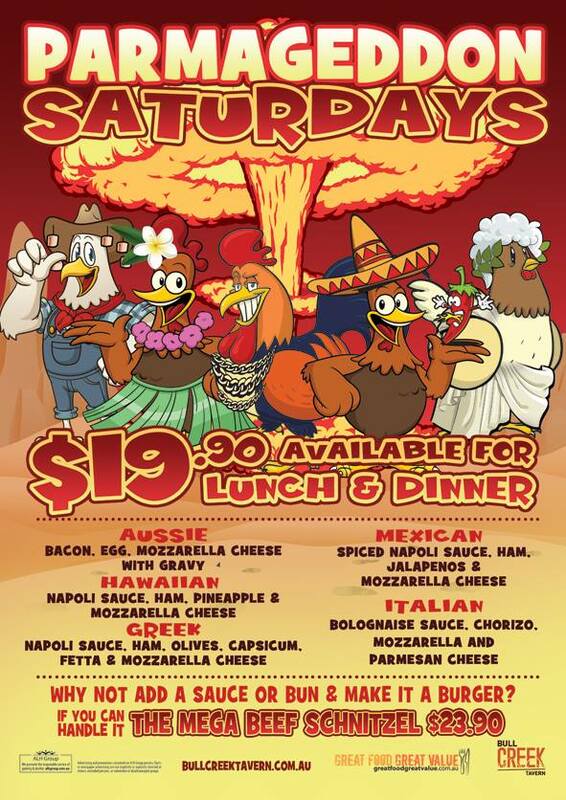 Parmageddon Saturdays – Less than twenty bucks gets you a great choice of parmigiana with flavours from around the world, plus chips! Affordable quality dining and a great beer selection, The Bull Creek Tavern is the perfect place to enjoy a meal, a drink, or catch up with family and friends while watching your favourite sports. The Bully is comfortable and relaxing with a dining area and bar area which includes 11 flat screen TVs and our 60 inch outdoor TV to catch all the action alfresco style. Burgers and Brews is what the Bully is all about with 13 brews on tap and 8 different burgers to choose from. We also have all the pub favourites in our extensive à la carte menu, sure to satisfy any craving. Seniors are also looked after with our Special Seniors Menu. We’re very close to bus stops on South Street and Benningfield Road, and we are within walking distance of South Street Train Station on the Mandurah line. 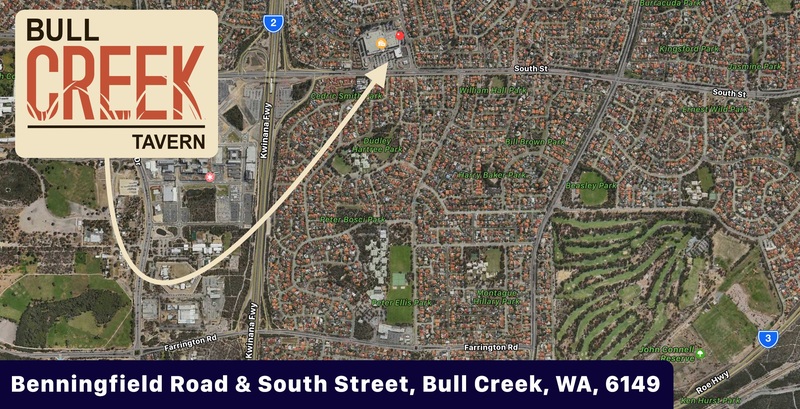 Less than five kilometres from the Spartan clubhouse, the Bull Creek Tavern really is your local watering hole! Our experienced Chef and his team produce high quality Burgers and Meals for your selection from our extensive Menu. Coffee and delicious cakes are also available. Meals can be enjoyed in our dining room area or outside in the Alfresco area.